The drill press being a basic woodworking tool, is more than a tool to a woodworker, it feels more like a friend. This is because of how versatile in use and function the drill press can be. Coming in a very simple design, the drill press comes with a number of parts that function differently. 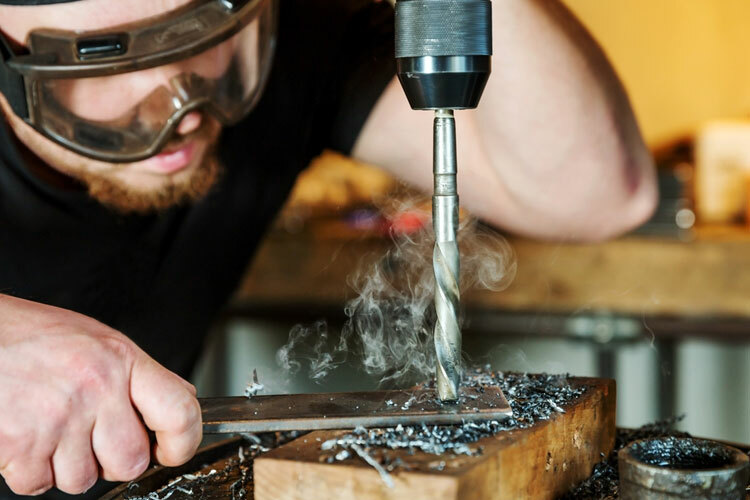 To understand the overall function of the drill press, you will need to have an understanding of what these parts are, and the individual function they perform. So, how does a drill press work different from other woodworking tools of its kind? So, How Does a Drill Press Work? The actual functioning state of a drill begins as you’ve installed one and turned it on. When you have the knowledge about the mechanism, you will not experience any difficulty making use of the drill press. Knowing the various parts of a drill press and their functions are what separates a beginner from a professional woodworker. At the end of this discussion, you should not just know how a drill press works, but also become a professional woodworker. The head of a drill press is that part of the tool that encloses the spindle. Located at the top part of the drill press’ spindle, the head allows for the upward and downward movements of the spindle. This is made possible by some components of the head which doesn’t allow the spindle to rotate, instead, it lets it move up and down alone. The drill press is a woodworking tool that needs the power to function. The power on and off switch is that part of the drill press that controls power that goes in and out of the drill press. The power off/on switch makes it easy for you to be able to put off and put on the drill press at will. In order to ensure safety while making use of the drill press, make sure the power on and off switch is in the best working condition always. The Quill lock is that part of the drill press that helps to secure the quill in place. When the quill is not properly secured, it can loosen while in use. So to avoid any hazard of any kind, you need to quill lock to secure the quill and ensure that it is in place. It’s considered to be one of the most important if not the most important part of any drill press; be it a benchtop model or a magnetic style. It’s responsible for the drill press’ rotation. As the spindle moves up and down the head, the drill press rotates. The faster the movement of the spindle, the faster the rotation of the drill press. The chuck of a drill press is what makes drilling possible. It also determines the quality and the accuracy of holes drilled making use of a drill press. A drill chuck can be removed and replaced for effectiveness. Timely maintenance of the drill chuck is encouraged for the overall effectiveness of the drill press. The table is also another very useful particularly of the drill press. The table is that part used to put working pieces and material in place. Coming with an adjustable ability, you are able to adjust to a 90-degree state where it aligns well with the column. Versatile in nature, you can move the table to any direction that you so wish and this has nothing to do with the shape of the table. The only difference is that a larger table offers you more space to put your materials than a smaller table would. Considering the usage of the table and the free movement, it needs to be secured so that while moving it, it doesn’t fall off. A table lock fastens the table to its hold properly. This way, while rotating or moving up and down, the table is well secured with the aid of the table lock. The Elevating handle is located at the end of one of the sides of the drill press that allows for a firm grip. This handle makes it easy for you to move the drill press in the direction of the hole to be drilled or any other purpose for which it is required. This elevating handle is usually made of solid materials to avoid it from getting damaged while in use. This is that part of the drill press used in tying down the table. Asides from that, it also helps to secure the surface or piece to be drilled in place. Designed to take the form of a long rod, it is able to stand in a vertical position to the table. It aligns at a 90-degree position with the table for effective drilling. The drill press always comes with a steel or iron base that gives the column all the support and stability it needs to function effectively. It also allows for the upward placement of the drill press making it easy to have a balanced surface while drilling with a drill press. The feed lever or the hand feed lever as it is referred to by some is that part of the drill press that is used to control the movement of the spindle. The feed lever makes it possible for you to decide the movement either upward or downwards of the drill presses spindle. The spindle needs to move at a regulated speed that is required of it which varies from job to job. The depth stop is that part of the drill press that helps in regulating the movement of the spindle, keeping it at an average. The variable speed handle helps to regulate the rotating speed of the drill press ensuring that it does not exceed the speed limit. It keeps the drill press within the speed limit required of the job. How Does a Drill Press Work as a Whole Unit? Every one of the aforementioned parts of a drill press all works together and not one for itself alone. The spindle, table, table lock, and quill lock give the drill press all the stability and strength needed to successfully carry out an accurate drill. With the drill press chuck, feed and elevating handles as well as the depth stop, more precise results are attainable. This discussion as no doubt provided an answer to the question ‘how does a drill press work?’ However, beyond just knowing about these parts and its functions, is the safety required to use each part. Make sure to adhere to safety precautions governing the use of drill presses at all times.